The Telegram messaging app said Wednesday that it had blocked 78 ISIS-related channels across 12 languages. However, private communications among ISIS members would not be affected by the move. On Tuesday, CNNMoney reported that Telegram had become popular among ISIS members for its promise of highly encrypted communication. It's "the new hot thing among jihadists," said Laith Alkhouri, director of Research at Flashpoint Global Partners. The Berlin-based startup boasts two layers of encryption and claims to be "faster and more secure" than its competitor WhatsApp, which is owned by Facebook. In a statement Wednesday Telegram addressed the issue: "Our mission is to provide a secure means of communication that works everywhere on the planet. In order to do that...we have to process legitimate requests to take down illegal public content (sticker sets, bots, and channels) within the app." That still leaves private communications protected. Users can securely message friends and send pictures and files. They can also create group chats with up to 200 members or opt for "special secret chats" where messages, photos, and videos will self-destruct. Even on public channels, picking and choosing who to block is a tough challenge. Some groups sympathetic to ISIS were reporting on Twitter that they already had been able to post to new Telegram channels. 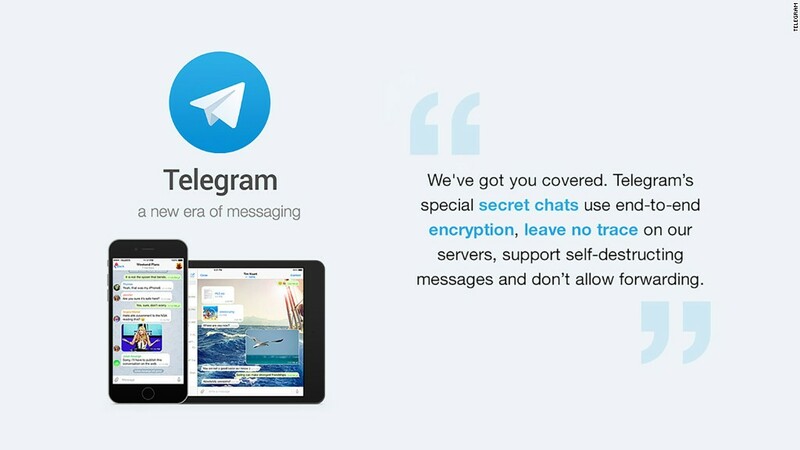 ISIS has used Telegram to broadcast big messages on the app's "channels," which are devoted to a variety of topics. It was on the official ISIS channel that the group said the Paris attacks would be the "first of the storm." Members in ISIS-related channels were also telling others to be careful. "They [Telegram] started their war on #IslamicState...be careful and from now on nothing is save [sic] to use," one Telegram user posted on an ISIS-channel. Encryption apps are increasingly in the spotlight following the terror attacks on Paris. Law enforcement sources confirmed there were encrypted apps found on cell phones believed to belong to some of the Paris attackers. Telegram launched in 2013 by brothers Nikolai and Pavel Durov, who has been dubbed "the Mark Zuckerberg of Russia." In an Instagram post on Tuesday afternoon, Pavel Durov said he showed support for those who lost their lives, though he also pointed blame at the French government: "I join all those who mourn deaths in the most beautiful city of the world. I think the French government is as responsible as ISIS for this, because it is their policies and carelessness which eventually led to the tragedy."